The Search function, in the Staff menu, is a customizable report of your staff members. It allows you to search through all of your staff to find only those that meet the criteria you select. Create a list of employees who have been with you for 5+ years for service awards (Start Date criteria). Ensure your staff's certifications are up to date (optional to use Staff Certifications criteria, Show Staff Certifications setting). Generate a list of your staff with birthdays in the coming month and email them a birthday greeting (Birth Month criteria, Email button in report results). 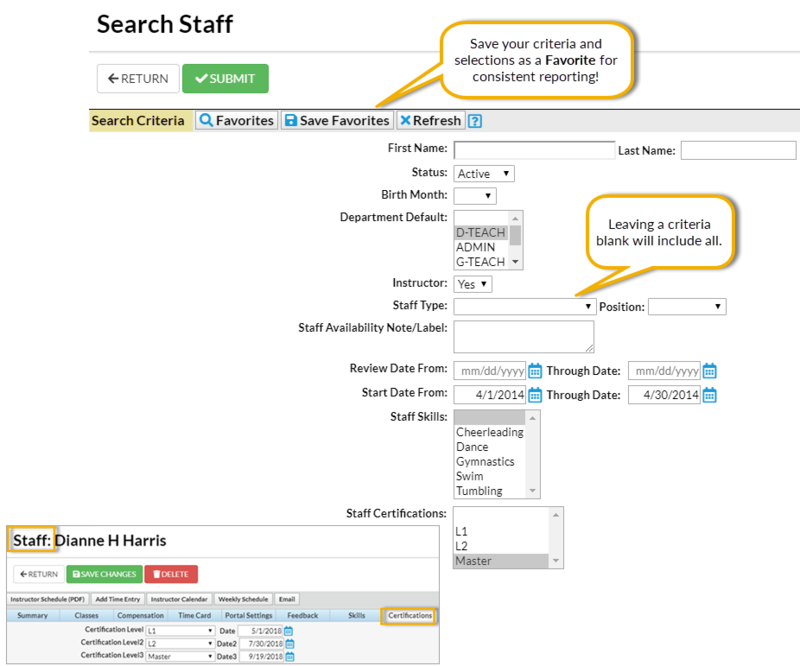 All of the search criteria in Search Staff pull information from fields in the Staff record. The more criteria you select, the fewer staff will be included in the report because a staff member must meet all the criteria. The selections made in this section apply only to staff members who are instructors that are assigned to classes. These selections will pull from fields located in the Class record. Use these settings to optionally add a column(s) to the report results to display Staff Skill and/or Staff Certifications. The Show/Hide Columns button allows you to customize your report by selecting which information to display. Select Apply to have these selections applied to only the report you are currently viewing. Select Apply & Save to have these selections applied and saved for your User ID. When logged in as your User ID, you will see only the columns of information you chose previously. Other Users will see the columns they selected and saved, which may differ from yours. Use Restore Columns to view all available columns. Email directly from the report results. 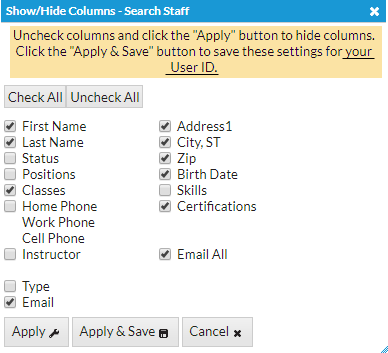 Use the Email All column to send to only selected staff or send to all. The Weekly Schedule link will open the Weekly Calendar filtered for that instructor. Use the Calendar link to go to open the Monthly Calendar filtered for that instructor. Note: If the staff member is not an instructor and you have set their Instructor setting (on the Summary tab of the Staff record) to No, they will not appear on the calendars.